1 Preheat the oven to 170°C, gas mark 3. Line the base and sides of a loose-bottomed, deep, 20cm cake tin. 2. Pour the Guinness into a medium saucepan with the butter and gently heat until melted. Remove the pan from the heat and stir in the cocoa powder and caster sugar. 3. Mix the eggs, vanilla essence and buttermilk in a bowl, then add this to the mixture in the pan. of the bowl and continue to mix thoroughly until all the ingredients are incorporated. 5. Pour the mixture into the prepared cake tin and bake for approximately 55-60 minutes or until the sponge bounces back when lightly pressed and a skewer inserted into the centre of the cake comes out clean. 6. Set aside to cool, then remove from the tin onto a wire rack, making sure the cake is cold to the touch before you frost it. 7. To make the frosting, use the electric whisk or the freestanding mixer with paddle attachment to mix the butter, icing sugar and vanilla together until it is fully combined in a smooth mixture. Add the cream cheese and mix on a low speed, then increase the speed to medium and beat until the frosting is light and fluffy. 8. 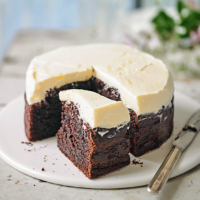 Place the cooled cake on a serving dish and spread the top generously with the vanilla cream cheese frosting.